» Mr. Smolin's poem to a young poet Always Be Madly In Love is now out and available. » In his latest release, Baby Methuselah, Mr. Smolin takes his trio on another off-kilter joyride through our bewildering contemporary circumstance via another dose of Psycho-Tonk jazz, just the remedy for coping with Trump's America. » Storytime with Mr. Smolin: My Lunch With Lautréamont, wherein a little green man relates his journey to the same old thing. 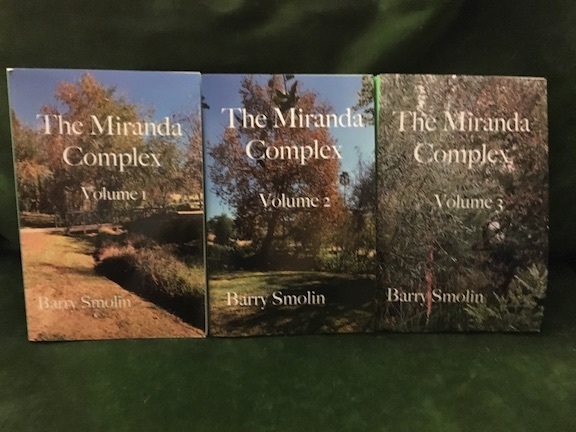 » Read Barry Smolin's fiction trilogy The Miranda Complex, the epic saga of teenage Lance Atlas and his always-misfiring relationship with Miranda Savitch, played out against a cultural backdrop that includes an adolescent-eye view of the politics, film, literature, and, especially, music of the 1970s as lived in the Beverly-Fairfax area of Los Angeles.